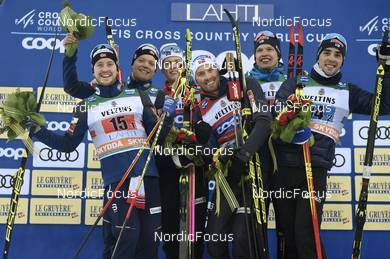 10.02.2019, Lahti Finland (FIN): Sindre Bjoernestad Skar (NOR), Eirik Brandsdal (NOR), Emil Iversen (NOR), Johannes Hoesflot Klaebo (NOR), Iivo Niskanen (FIN), Ristomatti Hakola (FIN), (l-r) - FIS world cup cross-country, team sprint, Lahti (FIN). www.nordicfocus.com. © Thibaut/NordicFocus. Every downloaded picture is fee-liable.